TERRATEST brings the first Light Weight Deflectometers which can speak on the market. The Light Weight Deflectometers, TERRATEST 5000 BLU guide the operator with audio instruction during the test. Apart from Bluetooth, printer, GPS-System and high performance battery, there is another feature which makes the operation of the Light Weight Deflectometers more easily. 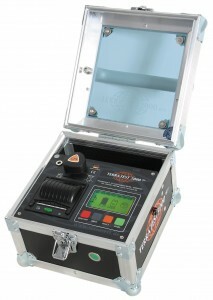 By new purchasing the Light Weight Deflectometers, you gain a huge advantage. The untrained operators will quickly get the support of the audio instructions of the Light Weight Deflectometers. At the end of the compaction tests even the final result is announced. The volume is adjustable at the testing electronics and can be even heard on the construction site. Easier could not be more!